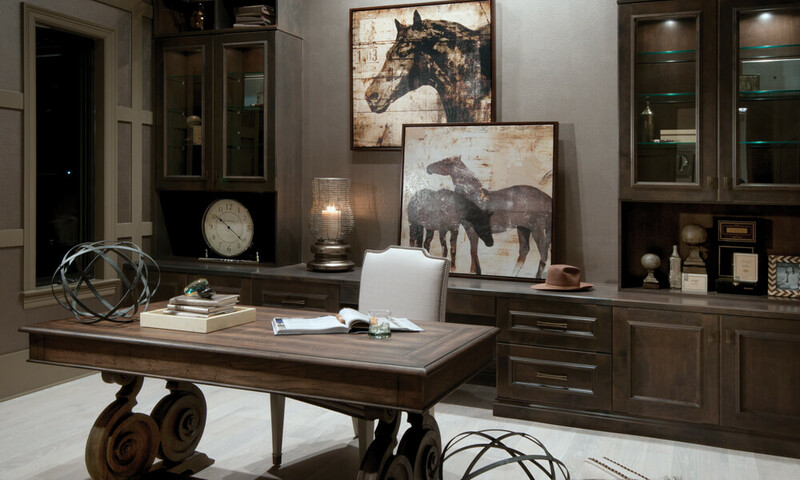 Allure Cabinetry & Showroom is more than a showroom – it’s an experience. More than 20 displays, including cutting-edge kitchens, spectacular bathrooms and breathtaking outdoor living areas, as well as a wine room, bar room, home office and library can be found throughout the 8,400-square-foot space located at 3573 Mercantile Avenue in Naples. The layout and design of Allure Cabinetry and Showroom was no accident. The placement of every display was carefully planned with the help of Ellen Cheever, an author and marketing specialist whose innovative design solutions has helped shape and create showroom spaces over the past 44 years throughout the country. That’s not a problem at Allure. When clients enter the showroom they step into a large, open space with high ceilings. To the left is a luxurious tub with cascading waterfall behind it. To the right is an entertainment area with fireplace, bar and wood floor. A short distance ahead, just past a modern kitchen display, is the reception counter complete with coffee bar on the back wall. Cheever said the openness of the showroom’s entrance has a purpose. According to Cheever, the purpose of a showroom is to allow the public to see a wide variety of different products and materials in real-life settings. A buyer’s biggest fear, according to Cheever’s research, is not getting what they thought they bought. “By seeing a display in a showroom they know exactly what they’ll be getting,” she said. The displays at Allure actually play multiple roles. It’s also very practical considering Florida’s demographic. The Allure showroom was also designed to be respectful of a client’s time. “All baths are located in one area. All contemporary products or styles are also grouped together. This prevents wasting time as clients can be focus on exactly what they are looking for and see everything available just a short distance from each other,” said Cheever. The final feature of Allure’s well-designed showroom is its ability to change.